In 2016, rescue archeological excavations of a Thracian burial mound were conducted four kilometers to the north-west from the town of Primorsko in the locality “Silihlyar”. Foundations of a rectangular feature were discovered in the eastern part of the mound. Its walls followed the cardinal directions and were preserved up to 0.55 m in height. During the excavations of this feature, 40 gold appliqués of a horse harness were found under the walls and the floor. They were spread over an area of cca. 2 m². One of them was found in a mortar layer of the floor, while another seven were between the stones of the northern and eastern walls. 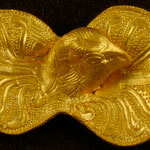 The central element of the set represents a decorated shield to which an embossed eagle’s head was attached. The clay lamp buried together with the gold appliqués suggests a deposition date of the set in a relatively narrow chronological range – 333-250 BC. The Treasure of Primorsko is the first fully preserved set of gold decorations for horse harness found to the south of the Balkan Mountains. Further interdisciplinary research is forthcoming. Balabanov, P. and Pantov, D. (2018) “Treasure of gold appliqués for horse harness from Primorsko”, Bulgarian e-Journal of Archaeology / Българско е-Списание за Археология, 8(1), pp. 1-16. Available at: http://www.be-ja.org/index.php/Be-JA/article/view/171 (Accessed: 23April2019).